Human heart with coronary arteries. Heart disease is a general category for grouping diseases that involve the heart and any structural or functional abnormalities of the blood vessels supplying the heart that impairs its normal functioning. 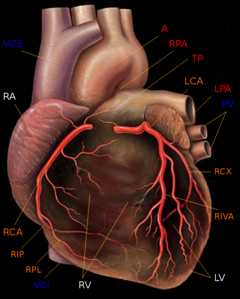 Included under this designation are such diverse medical conditions as coronary heart disease (including heart attack (myocardial infarction), angina), congenital heart disease, rheumatic heart disease, myocarditis (inflammation of the heart muscle), endocarditis, pericarditis, and arrhythmia. Heart disease is one grouping of diseases within the larger category of a cardiovascular disease, an umbrella term for grouping diseases that involve the circulatory system. Currently, heart disease is the leading cause of death in the United States (Miniño et al. 2007), England, Canada, and Wales (NS 2006), killing one person every 34 seconds in the United States alone (Hitti 2004). However, for most people, the heart functions remarkably well from birth, beating a little more than once a second throughout their lives. Beyond risk factors related to heredity, gender, and age, many of the risk factors involve aspects that people can control, such as smoking, high cholesterol levels, high blood pressure, obesity, lack of physical activity, and poor management of stress and anger. Coronary artery disease is a disease of the blood vessels that supply blood to the heart muscle. Although blood fills the chambers of the heart, the muscle tissue of the heart, or myocardium, is so thick that it requires coronary blood vessels to deliver blood deep into it. The vessels that deliver oxygen-rich blood to the myocardium are known as coronary arteries. The vessels that remove the deoxygenated blood from the heart muscle are known as coronary veins. Coronary heart disease typically is caused by the accumulation of atheromatous plaques within the walls of the arteries that supply the myocardium. Coronary heart disease itself encompasses such symptoms and conditions as angina pectoris (chest pain) and acute myocardial infarction (heart attack). Angina pectoris or angina is severe chest pain resulting from a lack of blood and hence oxygen supply to the heart muscle, most commonly due to obstruction or spasm of the coronary arteries. A heart attack (myocardial infarction) occurs when the blood supply to part of the heart is interrupted. This is most commonly due to occlusion (blockage) of a coronary artery. Heart attacks are the leading cause of death for both men and women all over the world (WHO 2002). Over 451,000 Americans die of coronary heart disease every year (AHA 2008; Friedewald 2002). In the United Kingdom, coronary heart disease is the most common cause of death, with 101,000 deaths annually due to this condition (BHF 2007). Congenital heart disease or congenital heart defect (CHD) is a defect in the structure of the heart and great vessels of a newborn and result from abnormal fetal heart development. Most heart defects either obstruct blood flow in the heart or vessels near it or cause blood to flow through the heart in an abnormal pattern, although other defects affecting heart rhythm (such as long QT syndrome) can also occur. Heart defects are among the most common birth defects and are the leading cause of birth defect-related deaths. Rheumatic fever is an inflammatory disease that may occur after a bacterial infection and that can cause inflammation of the heart. It is responsible for many cases of damaged heart valves worldwide. Myocarditis is inflammation of the myocardium, the muscular part of the heart. Although there are many cause, it is generally due to infection (viral or bacterial). It may cause chest pain, rapid signs of heart failure, or sudden death. Endocarditis is an inflammation of the inner layer of the heart, the endocardium. It usually involves the heart valves (native or prosthetic valves). Pericarditis is an inflammation of the pericardium (the fibrous sac surrounding the heart). Cardiomyopathy literally means "heart muscle disease" (Myo means "muscle," and pathy means "disease"). It is the deterioration of the function of the myocardium (that is, the actual heart muscle) for any reason. People with cardiomyopathy are often at risk of arrhythmia and/or sudden cardiac death. Intrinsic cardiomyopathies. These are any weakness in the muscle of the heart that is not due to an identifiable external cause. Dilated cardiomyopathy (DCM)—most common form, and one of the leading indications for heart transplantation. In dilated cardiomyopathy, the heart (especially the left ventricle) is enlarged and the pumping function is diminished. Hypertrophic cardiomyopathy (HCM or HOCM)—genetic disorder caused by various mutations in genes encoding sarcomeric proteins. In hypertrophic cardiomyopathy, the heart muscle is thickened, which can obstruct blood flow and prevent the heart from functioning properly. Arrhythmogenic right ventricular cardiomyopathy (ARVC)—arises from an electrical disturbance of the heart in which heart muscle is replaced by fibrous scar tissue. The right ventricle is generally most affected. Restrictive cardiomyopathy (RCM)—least common cardiomyopathy. The walls of the ventricles are stiff, but may not be thickened, and resist the normal filling of the heart with blood. Noncompaction Cardiomyopathy—the left ventricle wall has failed to properly grow from birth and such has a spongy appearance when viewed during an echocardiogram. Ischaemic or ischemic heart disease (IHD), or myocardial ischaemia, is a disease characterized by reduced blood supply to the heart muscle, usually due to coronary artery disease (atherosclerosis of the coronary arteries). It is the most common cause of death in many Western countries, and a major cause of hospital admissions. Its risk increases with age, smoking, hypercholesterolaemia (high cholesterol levels), diabetes, hypertension (high blood pressure), and is more common in men and those who have close relatives with ischaemic heart disease. Cardiac arrhythmia (also dysrhythmia) is a term for any of a large and heterogeneous group of conditions in which there is abnormal electrical activity in the heart. The heart beat may be too fast or too slow, and may be regular or irregular. Heart failure, also called congestive heart failure (or CHF) and congestive cardiac failure (CCF), is a condition that can result from any structural or functional cardiac disorder that impairs the ability of the heart to fill with or pump a sufficient amount of blood throughout the body. An example is Cor pulmonale, a failure of the right side of the heart. Valvular heart disease is any disease process involving one or more of the valves of the heart. The valves in the right side of the heart are the tricuspid valve and the pulmonic valve. The valves in the left side of the heart are the mitral valve and the aortic valve. Valve problems may be congenital (inborn) or acquired (due to another cause later in life). American Heart Association (AHA). 2008. Heart disease and stroke statistics: 2008 update. American Heart Association. Retrieved September 12, 2008. British Health Foundation (BHF). 2007. Chapter 1. Mortality. British Heart Foundation Statistics Database. Retrieved September 12, 2008. Hitti, M. 2004. Heart disease kills every 34 seconds in U.S. Fox News December 30, 2007. Retrieved September 12, 2008. Miniño, A. M., M. P. Heron, S. L. Murphy, and K. D. Kochanek. 2007. Deaths: Final data for 2004. National Vital Statistics Reports 55(19). Centers for Disease Control. Retrieved September 12, 2008. National Statistics (NS). 2006. Heart disease leading cause of death in England & Wales. News Release: Health Statistics Quarterly Spring 2006. Retrieved September 12, 2008. World Health Organization (WHO). 2004. The World Health Report 2004: Changing History. World Health Organization. ISBN 924156265X. . Retrieved September 12, 2008. This page was last modified on 24 September 2008, at 15:46.